Gone With The Fashion: Bon Appetit! 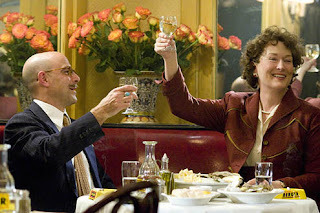 Julie & Julia made my Friday evening last week (yes, yes I may well have pre-ordered it). Meryl Streep - a firm favourite since The Bridges of Madison County - is brilliant, and in my eyes, still a winner! To mark this fact, the boyfriend and I shall be raising our glasses with a high pitched 'bon appetit!' whenever the opportunity presents itself.